Gardening Machine Accessories Lawnmower Primer Bulb Specification: Color: black Gasket diameter:22mm Primer bulb diameter:23mm Primer bulb high:24mm Application: Murray, Craftsman, MTD or etc. 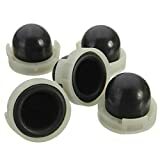 Replaces OEM: Briggs & Stratton 694394, 494408 Package Included: 1 x Primer Bulb. If there is a size or colour choice please email me with your choice or it will be sent at random.